BPT524: Get $5 off your purchase of $9.97+. Offer ends 5/30/12 at 11:59 PM EST. Your wedding day is a time for you to be pampered. Whether you’re getting your hair, nails or makeup done, you’ll want to do it in comfort and style. 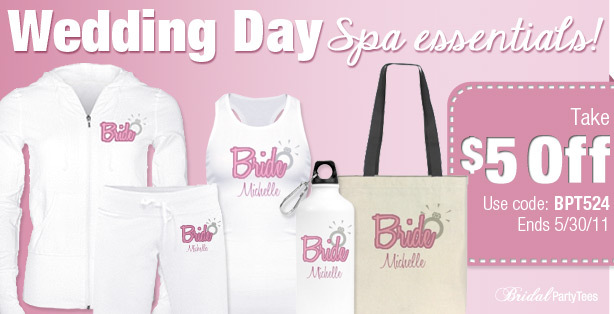 Our wedding day spa essentials are the perfect way to let everyone know that you’re the bride and it’s your special day. Choose from bride hoodies, sweatpants, tank tops, water bottles and bags!